Acknowledged author Marcia Stanhope RN DSN FAAN wrote Public Health Nursing: Population-Centered Health Care in the Community, 9e comprising 1120 pages back in 2015. Textbook and etextbook are published under ISBN 0323321534 and 9780323321532. 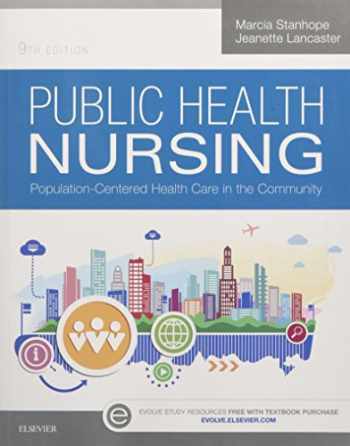 Since then Public Health Nursing: Population-Centered Health Care in the Community, 9e textbook received total rating of 4 stars and was available to sell back to BooksRun online for the top buyback price of $15.61 or rent at the marketplace. Prepare for a successful career as a community/public health nurse! Public Health Nursing: Population-Centered Health Care in the Community, 9th Edition provides up-to-date information on issues that impact public health nursing, such as infectious diseases, natural and man-made disasters, and health care policies affecting individuals, families, and communities. Real-life scenarios show examples of health promotion and public health interventions. New to this edition is an emphasis on QSEN skills and an explanation of the influence of the Affordable Care Act on public health. Written by well-known nursing educators Marcia Stanhope and Jeanette Lancaster, this comprehensive, bestselling text is ideal for students in both BSN and Advanced Practice Nursing programs. Evidence-Based Practice and Cutting Edge boxes illustrate the use and application of the latest research findings in public/community health nursing.Healthy People 2020 boxes highlight goals and objectives for promoting the nation’s health and wellness over the next decade.Levels of Prevention boxes identify specific nursing interventions at the primary, secondary, and tertiary levels.Practice Application scenarios help you apply chapter content to the practice setting by analyzing case situations and answering critical thinking questions.Linking Content to Practice boxes provide examples of the nurse’s role in caring for individuals, families, and populations in community health settings.Unique! Separate chapters on healthy cities, the Minnesota Intervention Wheel, and nursing centers describe different approaches to community health initiatives.Community/Public Health Nursing Online consists of 14 modules that bring community health situations to life, each including a reading assignment, case scenarios with learning activities, an assessment quiz, and critical thinking questions. Sold separately. NEW! Coverage of health care reform discusses the impact of The Patient Protection and Affordable Care Act of 2010 (ACA) on public health nursing.NEW! Focus on Quality and Safety Education for Nurses boxes give examples of how quality and safety goals, knowledge, competencies and skills, and attitudes can be applied to nursing practice in the community.